My baby girl is sick with a fever. So is my middle one, but for some reason she won't admit it. So in addition to resting my foot, these days, I am holding sick babies. I shouldn't look like I'm having so much fun, but any excuse to sit and enjoy them, to just hold them and be close to them and make memories of their precious faces...is pure gold to me. I am sorry about your ankle. Is is just a bad sprain? I have had PLENTY of those in my days, so I feel your pain! And sorry your kids are sick. I shouldn't admit it, but sometimes when my kids are sick I like it cuz that is the ONLY time they stay calm and let me snuggle them! 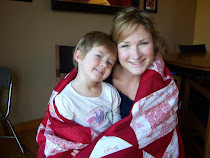 I agree with Kendra- I actually LIKE it when my kids are sick because they WANT to be loved & hugged & snuggled. Does that make me a bad mommy? I hope you're all up & around very soon! oh, you sit and take all the time you need. i love the like button. you have lots of likes!!!! Oh darn it! Poor girl! Get some rest, both of you!